September 2015 marks yet another dynamic product launch at Homecrest. The company’s deep seating complement is expanded with the introduction of Liberty, a timeless collection featuring mission styling and luxurious DreamCoreTM cushion comfort. In Sling and Woven Dining, the new Elements is a transitional collection that brings together clean lines and elegant contours. The popular Grace collection is expanded to include a full range of modular pieces, while the Lana spring collection includes exciting new seating surfaces, and Havenhill Cushion has grown to include the ever-popular specialty pieces. A number of dynamic introductions to dining and fire table collections turns up the heat for inspired outdoor spaces. New for 2016, Homecrest is pleased to introduce the Grace Modular collection. With a wide selection of modular units in different orientations and sizes, Grace can be scaled to your space, and pieces can be freely moved to suit the needs of the moment. Perfect for entertaining and yet beautifully suited to quiet relaxation, the luxurious comfort of Grace Modular combines with elegant styling and exceptional utility to create a welcoming atmosphere of gracious outdoor living. Echoing the gentle flares and subtle curves of the fashion-forward Havenhill dining collection, Homecrest is pleased to introduce Havenhill Deep Seating collection. Generously proportioned and exceptionally comfortable with its new DreamCore™ cushion, Havenhill allows for luxurious relaxation even in smaller spaces. Drawing inspiration from the beautiful craftsmanship of an earlier era in our country’s history, Liberty’s timeless design and unparalleled comfort will enhance outdoor spaces for generations to come. Create an environment of relaxation and serenity with a full complement of deep seating pieces, and carry design themes through to your dining area with Liberty Barrel Chairs. This iconic introduction hearkens back to early days in Homecrest’s history. This richly updated piece features the wraparound comfort of our traditional barrel chair and the unsurpassed comfort of Homecrest’s industry-leading coil spring swivel rocker, while incorporating timeless design elements of our Liberty Deep Seating collection. As a front porch vignette for two, or elegant dining for a crowd, the Liberty Barrel Chair will create an engaging ambiance that celebrates the past and the future. Aurora Natural Series is available in Homecrest’s Stonegate and the new Timber Table Series for 2016. Available in 19” coffee and 24.5” chat table heights with a powerful 65,000 BTU burner, the amazing heat will extend your outdoor season while Aurora’s beauty creates an atmosphere of relaxation and conversation. Homecrest’s Valero fire table is now available in the intimate 19” coffee height for 2016, along with 24.5”chat, dining and balcony heights. Valero fire tables are available with all Homecrest Natural Series table tops; and softly curved side panels are available in aluminum, which may be powder-coated to match or contrast with your frame, as well as in 5000-hour resin wicker in Coco or Hampton, according to your design preferences. Cast from beautiful reclaimed wood tables, the Timber collection is at once on-trend and timeless. Using the same technology we use in all Natural Series tables, we are able to achieve a look that is marvelously realistic while retaining the outstanding outdoor performance characteristics you expect from Homecrest. Available in Sequoia and Drift colors, choose from a wide range of sizes in dining, occasional and balcony heights, or warm up fireside with the new Aurora Timber 42” square fire tables. With clean lines and contemporary inspiration, Mode sets a new standard in casual chic. Aluminum panels in Onyx float over a base frame in the color of your choice, creating a space that is elegant in its simplicity and fresh in its styling. Select from a wide variety of heights and sizes to complement the fashionable seating of your choice. 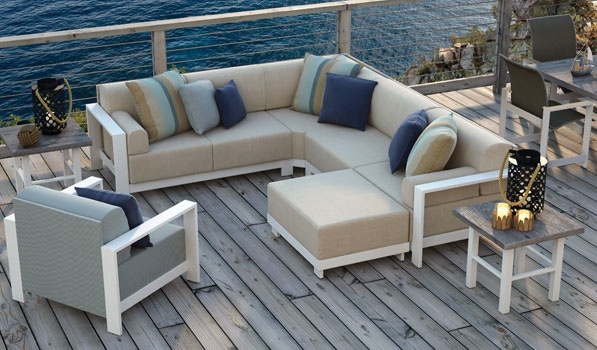 Whether traditional, transitional or contemporary in design, Homecrest’s deep seating collections are at once beautiful and incredibly comfortable. We use innovative techniques and top-quality materials to ensure that beauty and comfort last for decades. The DreamCore™ cushion core begins with High Resilient furniture grade foam for the interior of the cushion. High Resilient foam provides exceptional durability and longevity, while offering an outstanding level of comfort. Unlike Viscoelastic foam (memory foam), the cell structure of High Resilient foam is less uniform and more random than conventional foams, which creates stronger structure, excellent elasticity and increased supporting force, thereby providing support, resilience, and ultimately, unparalleled comfort.